Whenever I create databases with information like ESXi Versions, vCenter Versions or VMware's HCL I try make these available to be used for automation or in scripts. JSON is my data-type of choice but I figured that another structure might be easier to handle in some circumstances. This is why I've now created separate versions where it is now possible to access the information with keys. There are still some problems, but especially with HP, Dell or IBM Systems, it produces good results. The database used at my VMware Product End Of Support Countdown is now available in JSON. The database is based on VMware Lifecycle Product Matrix and allows you to use the information in scripts or for automation purposes. I’ve also written a small script to demonstrate what this information can be used for. 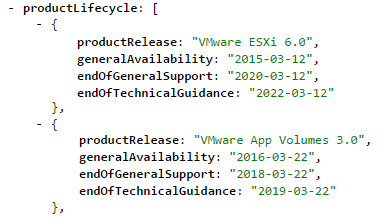 Out of many reasons, I need VMware ESXi version information in a format that can be reused in scripts. I maintain a manual list since a couple of years but this list can't be used for automation purposes. 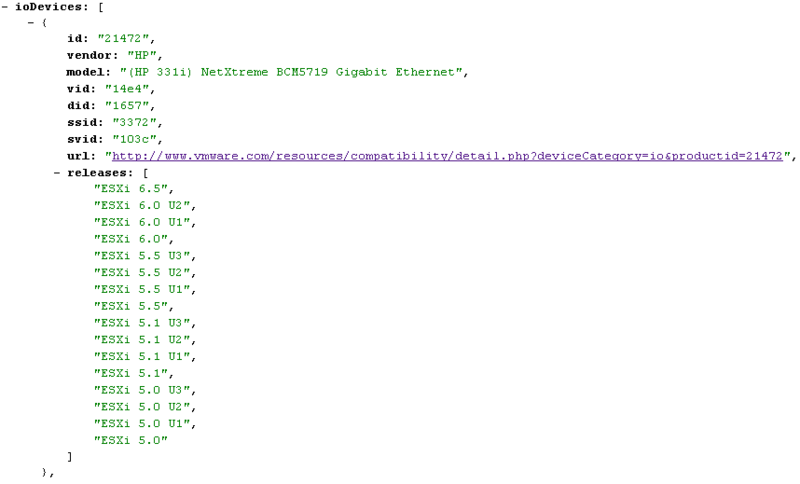 VMware does not provide this information in the required format, so I created my own database which is now also available as JSON file.